Whether recovering from an acute injury, surgery or overuse injuries Therapeutic Massage can aide in the recovery process. Massage supports soft tissue healing by facilitating blood flow to the injured area, decreasing the armoring of surrounding muscles, mobilizing scar tissue that forms over the injured area, breaking up facial adhesions and scar tissue that develop and decreasing associated pain. 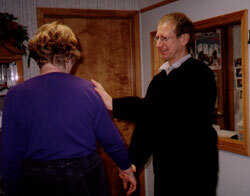 Massage techniques help normalize the connective tissue thus increasing range of motion and pain free movement. Approaches often effective in facilitating recovery following injury include: Orthopedic Massage, Myofascial Release, Deep Tissue Massage, Reflexology, Medical Massage, Energy work. Therapeutic massage is very helpful for injury recovery from repetitive strains. These injuries are generally caused from overuse of certain muscle groups because the individual does the same movement over and over (repetitive movement). If these injuries are left untreated they can lead to increased pain, loss of function of the affected area and decreased ability to perform daily tasks. They can lead to loss of work along with costly workman’s compensation claims. Therapeutic massage is very helpful with injury recovery of such repetitive strain problems as carpal tunnel syndrome, tendonitis, and plantar fasciitis.